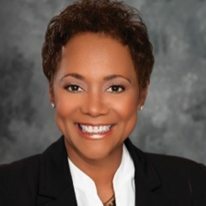 Antoinette Hardy-Waller | The Leverage Network Inc. Antoinette Hardy-Waller – The Leverage Network Inc.
Antoinette (Toni) Hardy-Waller, RN, BSN, MJ is an accomplished senior executive, entrepreneur and clinician, with extensive leadership and management experience. She has more than 25 years of experience building, owning and managing health care businesses. Her work with major health care systems includes developing business strategies, implementing effective integration strategies to enhance continuums of care, and turn around strategies for struggling health care entities. Toni is Chief Executive Officer of The Leverage Network (TLN). TLN is a non-profit organization committed to the promotion and advancement of African Americans to leadership, governance and entrepreneurial roles in healthcare. Through collaboration and partnerships TLN enhances awareness of the socio-economic challenges of African Americans and the significant impact on health disparities; promotes African Americans in leadership and governance roles to better respond to the health care needs of that population and facilitates leadership development of those individuals moving into key decision making roles. Prior to co-founding TLN, Toni founded Strategic Health Transformations (SHT), a national consulting firm assisting health systems in the development of post-acute continuums of care and strategies to meet accountable care requirements. She continues work with SHT as CEO. Toni was Vice President of Strategic Partnerships for Health Dimensions Group where she developed and implemented their first Advisory Board consisting of C-Suite Executives from 10 major health systems from across the country. She has been Founder and CEO of two successful skilled home health companies, the first of which grew to become the largest proprietary home care company in the Chicago area. Toni has a Master’s Degree in Jurisprudence from Loyola University School of Law and earned her Bachelor Degree in Nursing from the University of Illinois Chicago. She recently authored “Increasing Board Diversity: An Imperative for Success in the Next Era” (Nurse Admin Q, Vol. 39, No.1, January-March 2015, pp. 23-27) where she speaks about the importance of nurses on boards. She has served on several healthcare boards to include Alegent Creighton Health, the National Association for Health Services Executives, and the American Hospital Association’s governing boards for The Center for Healthcare Governance and Long Term Care. She founded the CEO/Entrepreneur Track for NAHSE and Co-Chaired their CEO/Senior Executives Conference for multiple years. Currently Toni is a member of the Board of Stewardship Trustees for Catholic Health Initiatives and Chairs the Board Quality and Safety Committee. Her work as a nurse clinician, entrepreneur and governance have provided her with firsthand experience and knowledge of the journey to the top as an African American female in the healthcare industry.